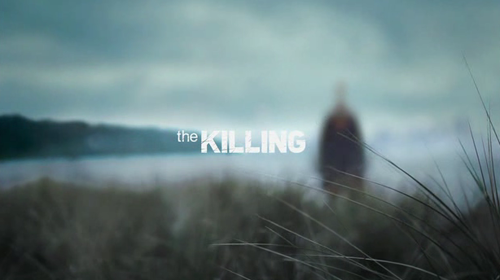 I watched The Killing on Netflix at a point when there was only one season available for streaming. I had heard a bit about the show but hadn't had any real, pressing interest in watching it. I started watching with very low hopes and even lower expectations. A couple episodes in and despite not hating the show, I was still feeling "meh" about the whole thing. And then I was on episode 8 or so and realized that I couldn't stop watching the show. It wasn't the particular episode that had hooked me - I realized that this whole time the show had been creeping up on me and I was just becoming aware of it now. Dammit AMC! You win, again! I also love Mad Men and Hell On Wheels. Before I jump into some details, let me say that I've never watched the original Forbrydelsen so I can't speak to the relationship between the two. When I was describing the show to a friend I said that it's as if Twin Peaks and Seven had a baby together. The setting looks like it was cut from the exact fabric that Seven was cut from while the story, well, you don't need to be the card-carrying, Twin Peaks nerd that I am to see how closely related The Killing is to it. - Murder of a popular high school girl. - Turns out she's got a secret life. - There's a ring of high school escorts / prostitutes. - Drugs are, of course, involved. - A cop with a dark past that calls their ability into question. - An obsessive cop who will stop at nothing to uncover the mystery and send the RIGHT person to prison. - A major player in town is somehow involved. - Everyone is having an affair with someone else. - Many secrets can be learned at the casino that is just outside of town (and just outside of police jurisdiction). - Mireille Enos is a terrific actress but, I absolutely hated her character (Sarah Linden). Everyone does. No one hates Agent Dale Cooper though. - There's nothing supernatural going on in The Killing, although some might argue that there's definitely "evil" present there. Some other time we can dissect the difference between "supernatural" and "evil" and all of those other meaningless, metaphysical concepts. - The level of high-reaching conspiracy is ludicrous. - I've seen better detective skills on Rescue Rangers. - How does Linden manage to be such an obviously terrible parent AND NOT have social services take away her kid? Now, my interest has come full circle: I wasn't impressed with season 3. I struggled to pay attention at some points, really fighting to regain my enjoyment. Based on that, I am doubtful that the upcoming season 4 will have much to offer. All the plot-holey mystery aside, there's something undeniably engaging about the first two seasons and I'm not at all sad I watched them. ... and when do I ever write anything like that?